Interstate 469 is the 31-mile beltway around the city of Fort Wayne in Allen County. The highway is known as the Ronald Reagan Highway, though this name is not used commonly. The interstate is a four-lane concrete highway with a barrier median separating traffic. The majority of the route traverses agricultural fields, though northern reaches pass through the Fort Wayne suburbs. 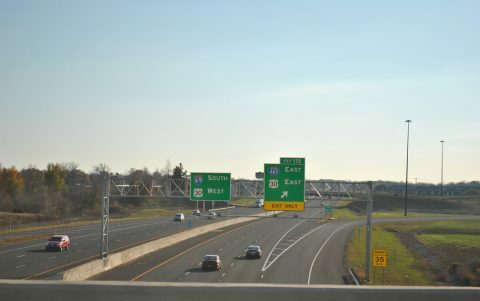 Still, since it goes out of its way as a bypass, Interstate 69 through traffic is more likely to remain on the parent route than use the loop. Construction started on I-469 in the 1980s, with it temporarily designated as Indiana 469. Once completed in the 1990s, the interstate became the bypass for Fort Wayne, carrying U.S. 24, U.S. 30 and U.S. 33 on their respective courses around the city. A suburban end to Interstate 469 in northern Fort Wayne. Photo taken November 6, 2011. Northbound along Maplecrest Road at the six-ramp parclo interchange with Interstate 469 & U.S. 30. Control cities are not used for the Fort Wayne loop. Photo taken 11/06/11. The westbound freeway ends at Interstate 69, two miles to the west of Maplecrest Road. Photo taken 11/06/11.